Control Solutions’ Model AMJR-14-IP i.CanDoIt® Web Enabled I/O Programmable Modbus Controller is a full featured embedded web server with 14 I/O points, template or rule based alarm monitoring and email notification, weekly or time and date scheduling, and data logging. The embedded web server includes many predefined pages, but you can create your own HTML pages and forms to customize the server for your application. 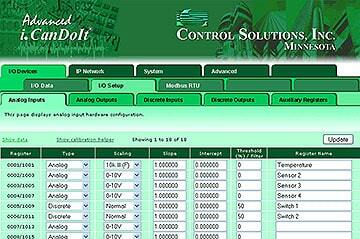 In addition to web access, you can access I/O points as Modbus TCP registers or SNMP MIB variables. The AMJR-14-IP is programmable with the i.CanDrawIt® graphical programming tool. The goal of i.CanDoIt® is to provide a simple and cost effective facility management and remote monitoring solution suitable for use in small sites. The i.CanDoIt® Modbus web server includes data logging, time & date scheduling, and template or rule based alarm processing with email notification and/or I/O activation in response to events. 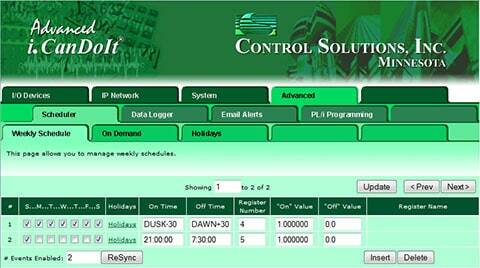 Data logging simply records the contents of registers on a user specified schedule. Event logging keeps a record of alarm events. Scheduling causes register values to be set according to a schedule. The resulting register manipulation may generate network communication with remote devices, control local I/O, or change setpoints. The i.CanDoIt® is programmable, even though it is rather powerful without programming. The Modbus version of the i.CanDoIt® server features a Modbus RTU Master and Modbus TCP Client and Server. This server is ideal for systems based entirely on Modbus. The server will support polling of up to 50 RTU slaves, and IP connections with 25 TCP/IP devices. 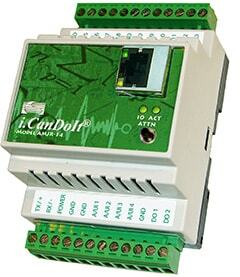 The i.CanDoIt® server as a Modbus controller is freely programmable. Control Solutions’ i.CanDoIt® AMJR-14-IP hardware features 12 inputs which accept analog input from thermistors or 0-10V sensors, or discrete input from dry contact switches. AMJR-14 also provides 2 discrete outputs which can sink 1A at 24VDC. Data is presented in scaled integer and floating point format. Linearization tables are provided for 10K and 20K type II, III, and IV thermistors on analog inputs. Input and output type and scaling are configured in web pages served by the internal web server. The AMJR-14-IP also makes an economical Modbus TCP slave I/O device. Read and write physical inputs and outputs as holding registers. Use the server map to create a virtual Modbus device that lets you access I/O points as any type of register, including Modbus coil. You can also use Modbus TCP to read and write registers that are mapped to the Modbus RTU master, giving you Modbus TCP access to slave Modbus RTU devices. The AMJR-14-IP can be used as an SNMP I/O device. Read physical inputs using SNMP Get. Write physical outputs using SNMP Set. Via the Modbus RTU mapping, using SNMP to Get or Set registers in slave Modbus RTU devices. Set up SNMP Traps to give you notifications when physical inputs or slave Modbus registers exceed your given threshold. Click on the link below to view a demo copy of the entire Web UI in the AMJR-14-IP.